This novel certainly kept my attention and even though it honestly scared the bejesus out of me, I couldn’t stop reading it. 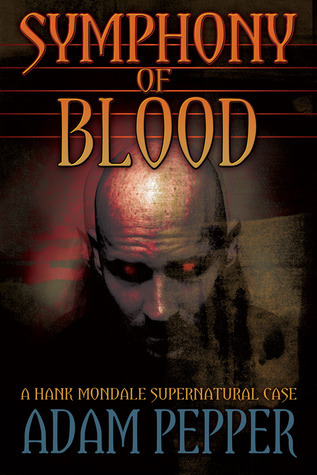 Symphony of Blood has a good plot and is delivered with a clear narrative voice. The author used different techniques from what I’m used to and I found it intriguing. Switching point of view mid-novel is risky but I found it to be very effective and well suited for this story. At first the story is told from the main character’s point of view, and then mid novel it changed to the creature’s and spent a good deal of time explaining where it came from and why it did what it did. I had all these pre-conceived notions and then, wham! Things turned to be something completely unexpected. This was where the strength in this novel was. The element of surprise! Hank is a private investigator hired by a wealthy businessman to find the monster that was tormenting his daughter to the point of insanity and threatening to kill her. He was skeptical and even desperate for money; Hank was going to turn down this case. He figured this entire thing was just a ruse created by a spoiled socialite. In the end, Hank’s need for money made him take the case. Without giving too much away, his investigation starts pointing towards a possible link between different murders happening all over the city. A little bit more on Hank… Struggling to keep it together, Hank has severe financial troubles and a very addictive personality – gambling and drinking seemingly the worst. Despite his faults, I liked Hank because he was honest, had morals and was just a nice guy. I rooted for him and wanted him to do better. So, the monster, named Symphony, turns out to be real. The author devoted a good part of the novel to Symphony. It was a creature that needed to eat people to survive. It was incredibly gross how it did so and the novel went into a lot of detail about it. However, as you read Symphony’s story, I actually started to sympathize realizing it wasn’t really evil but was just doing the same as what other animals do to survive. There’s a very nice twist as Symphony’s story unfolds. I liked it! So back to the spoiled socialite…at first, scared out of her wits, MacKenzie seemed to be a victim and I sympathized with her. She showed a caring side towards animals even having her own zoo and took care of the animals herself. As the story evolved, MacKenzie showed that she was indeed a spoiled socialite with a tendency towards danger and mischief. We didn’t get to hear why she was like that so I had to make an assumption…like father like daughter. I am a reader that enjoys a lot of characterization. I tend to focus more on that skill of an author. In my opinion, this novel felt a little weak in this area. I would have liked to hear a bit more about what led to Hank’s self-destructive behavior and why the wealthy Mr. Blake hired Hank in the first place. I assume it was because Hank was desperate enough to be totally discrete but its not really explained. How did he even know about Hank? If you like novels by Stephen King and Dean Koontz, then you will really enjoy this one. I feel Symphony of Blood’s strong point is its element of surprise! Things are never what they seem. It’s a thriller/horror with paranormal elements and if you scare easily, you may want to have a teddy bear or security blanket with you. I did! 3 Bad Boys – Good!! !